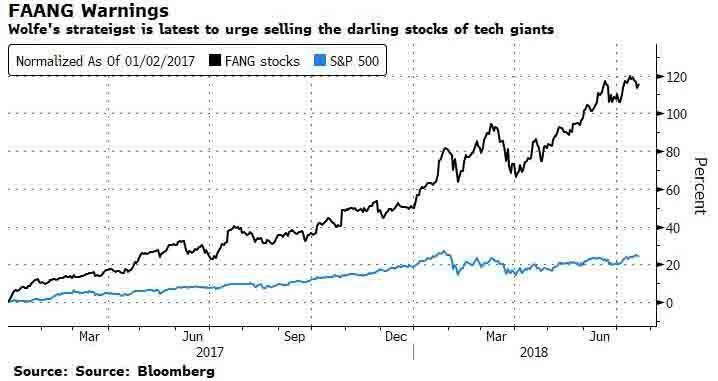 While the FAANG stocks remain a favorite group for both institutional and retail investors, having been responsible for all the market gains in the first half of 2018, a new round of warnings about their future performance has emerged in recent days. ... you see, when something has worked for six, eight, ten years, people do tend to consider it a perpetual motion machine and think it'll go on forever; and people say, Well, is that what's going to crack it? And the answer is, well, what's going to change their mind? As long as they think that Amazon and ETFs are perpetual motion machines and they keep putting in capital, they won't crack. So clearly, when they crack, that could be something that hurts the market a lot. What's going to make them crack? 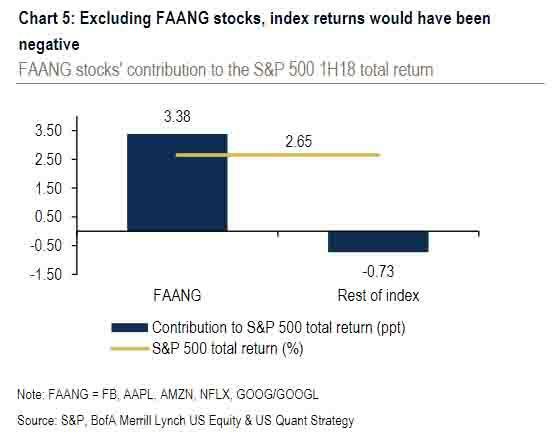 Marks' latest warning follows several previous ones, most notably last summer when he cautioned that the addiction to FAANG gains is among a handful of investor vulnerabilities that could spell doom for the bull market. Back in November 2016, Jeff Gundlach also urged investors to avoid the group; since then FAANGs have dramatically outperformed the broader market much to the chagrin of David Einhorn whose "short basket" of mostly tech names has led to dramatic undeperformance for Greenlight Capital in 2018. 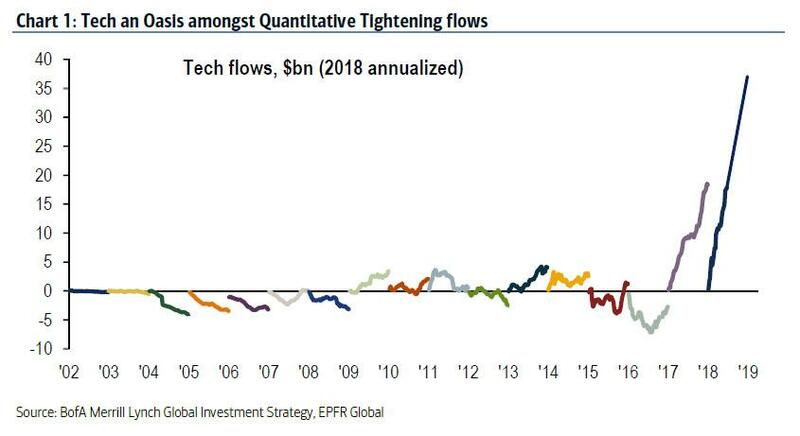 Still, all warnings have so far fallen by the wayside as inflows in the tech sector continue to run at a record pace, suggesting that bullish sentiment is so entrenched it would take a shock to shake investor confidence. Demonstrating the resilience of the euphoria for FAANGs, not even Netflix' surprisingly week Q2 results and guidance did much to dent enthusiasm for the e-commerce and tech names, and the Nasdaq in general. However, relentless upward price action does not mean that analysts can not and should not try to warn about the potential risks investors face by putting money into this group, the majority of whose members trade near at all time highs, and today another strategist fired a warning shot at the at the FAANG sector. Investors are chasing the most expensive stocks, treating them as safe amid an escalation in trade tensions, but it’s a stance likely to backfire, he said quoted by Bloomberg. As a potential downside catalyst, Senyek noted that no matter the trade war outcome, tech stocks are likely to suffer in both a favorable or unfavorable outcome. This too warning is being ignored today, with Nasdaq well in the green, and FANG stocks surging on average 50% in the past year, quadrupling the gains of the S&P. Meanwhile, the next chart shows the closest thing to price indescriminate euphoria the market has experienced since the dot com boom: expensive stocks get more expensive and cheap stocks get cheaper, a sign that investors are riding momentum and caring little about how much they pay, Senyek said. The valuation gap between momentum darlings and overlooked stocks are particularly extreme in the tech space. 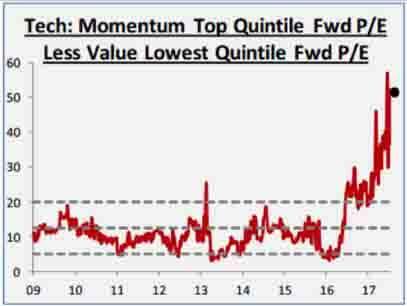 As Bloomberg further notes, the PE multiple for the highest momentum stocks is now about 50 points higher than those with the lowest valuation. In the previous nine years, the gap mostly stayed below 20 as a result of an unprecedented scramble to allocated capital to the one group that has continued to outperform no matter the macro environment. Meanwhile, the core underlying paradox remains: "Perversely, some of the market’s most expensive stocks have been viewed by investors as safe havens during turbulent time," Seynek said. “We’d use these stocks as a source of funds in the weeks ahead." For now, however, sellers are missing, as is the answer to Marks question: "What's going to make them crack?"